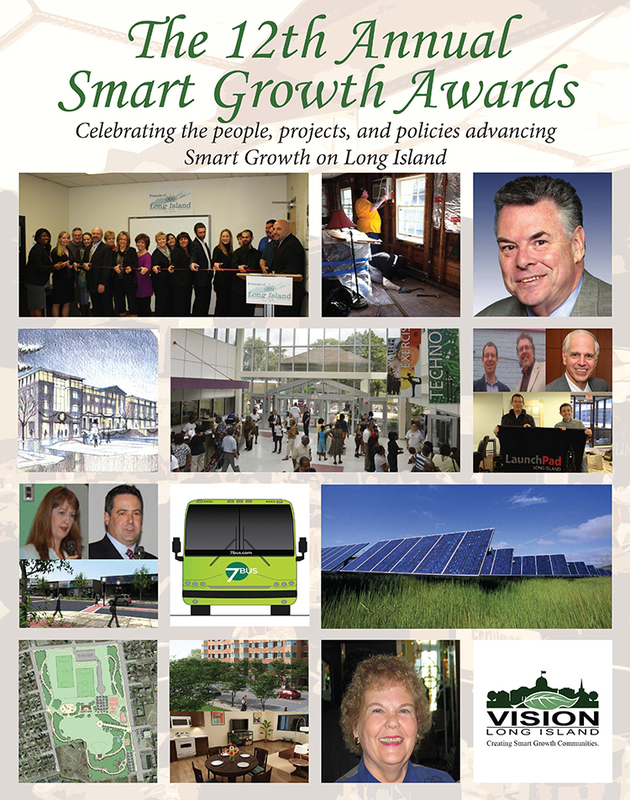 We are pleased to report that the 12th Annual Smart Growth Awards was a special event for all of us working to maintain and create great places on Long Island. The attendance was the largest we have ever had and the energy in the room was spectacular. The stage full of Sandy volunteers or the tributes to the many leaders and projects were all highlights. 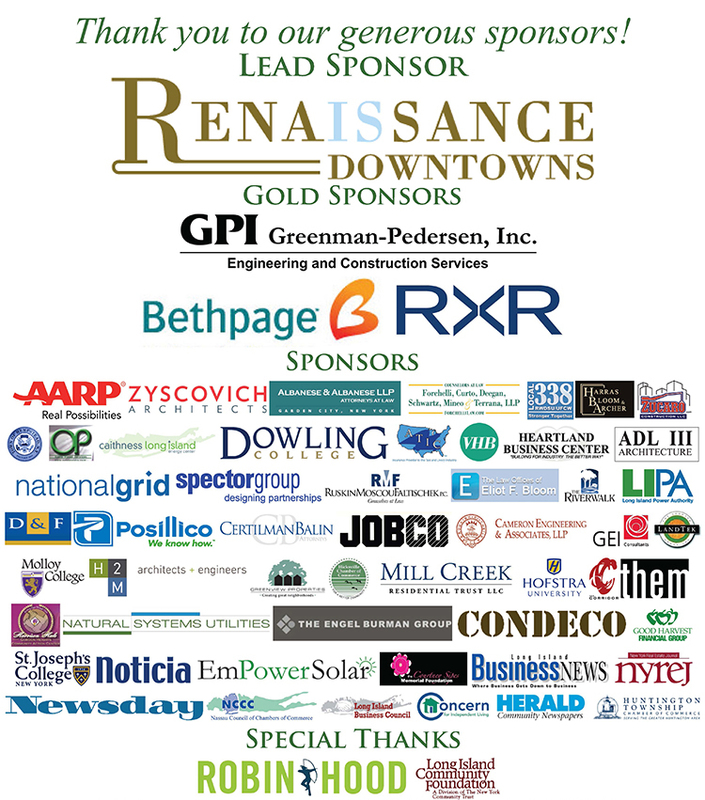 We would like to thank all of the communities, businesses, public officials and sponsors who made the event a success but more importantly thanks for all you do each day to advance Smart Growth on LI. 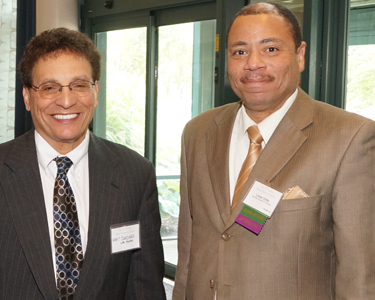 The 12th Annual Smart Growth Awards took place on Friday, June 14th from 11:30am to 2:00pm at the Huntington Hilton in Melville. 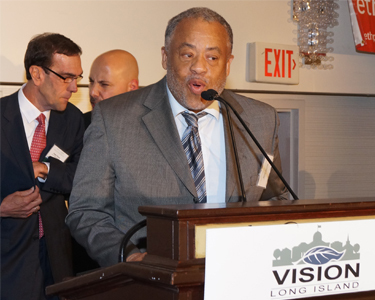 With over 700 attendees, including guests speakers and Award winners from all across Long Island, this year’s event honored diverse groups and individuals from various sectors that have shown leadership in the wake of Hurricane Sandy and exemplify Smart Growth principles. This year’s honorees were: US Congressman Peter King for his efforts in the passage of the Sandy relief bill and the transportation bill, Post-Sandy Rebuilding Volunteers for their rebuilding efforts and support for Sandy victims across the island, “Yes We Can!” Center of New Cassel, Joy Squires of the Huntington Conservation Board, for her efforts in preserving open space, Lavena Sipes of the Courtney Sipes Memorial Foundation and Mark Mancini of the Greater Smithtown Chamber of Commerce, 7Bus for providing alternative, clean transportation, Central Islip Coalition of Good Neighbors & Islip Councilman Steve Flotteron for the Central Islip Revitalization, D&F Development and the Greater Hempstead HDFC for the Linden Knolls project, LaunchPad in Mineola and Peter Goldsmith of LISTnet for mix of uses, the Connect Long Island project and Republic Station in Farmingdale for smart planning, and LIPA’s Clean Energy Programs for stimulating investment in clean, renewable energy investment on the island. 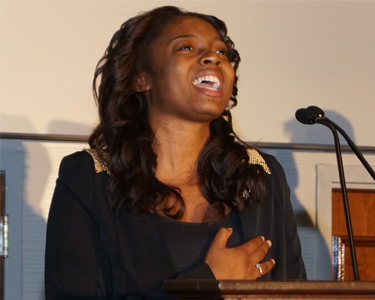 The event opened with the singing of the National Anthem by the talented Shardae Hale of the Cornerstone Church of God in Christ, which received a standing ovation, and an opening prayer from her father Bishop Harrison Hale. 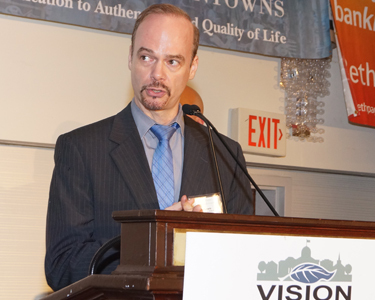 Vision’s Executive Director Eric Alexander introduced the honorees this year, followed by a short film of each honored person or project and a brief speech by the honorees. 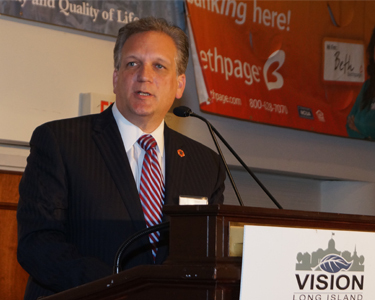 The event featured Nassau County Executive Ed Mangano who spoke on the importance of growing economic centers such as the Nassau Hub in a way that leans towards Smart Growth. 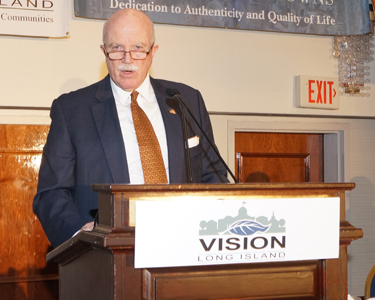 He also expressed an appreciation for the Smart Growth movement on Long Island and the need to continue pushing for those ideals in local municipalities across the island. 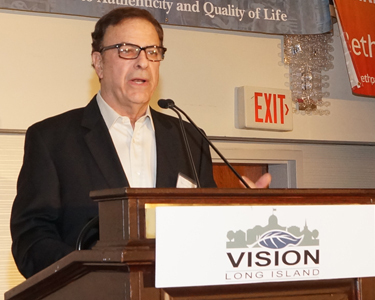 Vision Long Island Board President Ron Stein also spoke, calling for a moment of silence for the passing of Larry Kushnick, a local lawyer who was at the forefront of the Smart Growth movement and many other community causes. 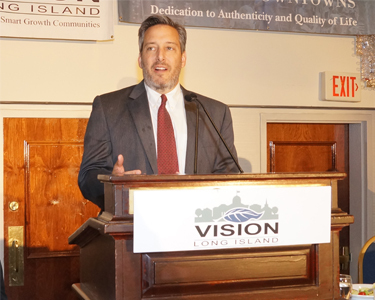 Next up Don Monti of Renaissance Downtowns spoke on the new Destination Long Island program that his company is hoping to use as a way to engage a younger generation on what is needed to keep them local. 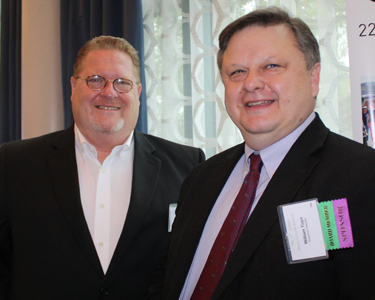 Bill Tuyn of Greenman Pedersen also spoke to promote the upcoming CNU conference in Buffalo. The Smart Growth Awards honor individuals and organizations taking leadership in advancing Smart Growth projects, policies, regulations and initiatives. 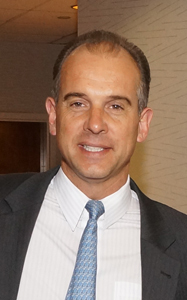 The event highlights the efforts of leaders in government, private sector, and the community that exemplify Smart Growth principles in such areas as transportation, mix of land uses, housing options, open space preservation, clean energy, compact design, revitalization, sense of place, and planning. Smart Growth favors mixed-use, mixed-income development that is attractive and strategically designed to enhance the greater area. Smart Growth reduces traffic by making transit, walking, and biking realistic and pleasant options, thereby contributing to community health, safety, and vitality. It embraces clean energy and sustainability by design. It focuses on infill, redevelopment, and open space preservation in order to create more livable places conducive to a variety of transit options. THEM Media Inc. is a multi-disciplinary integrated media company producing content for television networks, advertising agencies, film studios and record labels. THEM was founded by Executive Producer Tony Harding in 2006 as a 21st-Century production company set to address the changes, challenges and overlaps in the advertising arena, television programming and new media landscapes. Tony Harding’s vision was to merge exceptional talent from diverse media backgrounds to become, together, a powerful multi faceted production boutique. THEM offers an innovative blend of creative production, development, new media and programming. THEM’s diverse portfolio of media projects includes television programs, commercials, music videos, feature films, branded entertainment and branded content for the web and mobile devices. THEM Media’s company culture is to challenge conventional thought, provide clients with innovative concepts in a collaborative and inclusive environment and aggressively deliver cutting edge solutions. The company’s versatile think tank talent roster is comprised of accomplished directors, ad savvy creatives and seasoned producers, who embrace Harding’s “can do” philosophy and always find innovative ways to enable clients to achieve their objectives. 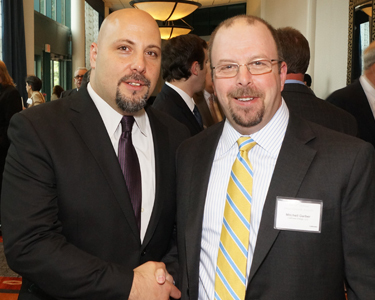 The award for “Mix of Uses” went to LaunchPad Long Island, a project started by local entrepreneurs and co-founders Andrew Hazen and Richard Foster, a space for independent startups and small firms, and LISTnet for their work to make LaunchPad a reality. 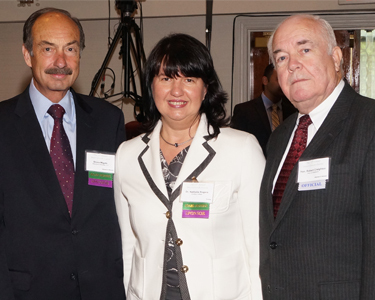 LISTnet was created to promote Long Island as one of the national centers of excellence for Software and Technology solutions through the facilitation of collaborations between local companies, establishing forums and events for the exchange of information, improving the quantity of the labor force and partnering with companies that provide the High technology Centers necessary for the growth of L.I. software and technology companies. Mr. Goldsmith recently re-located his offices to LaunchPad, bringing along the COMETS program, a hi-tech business accelerator that was also spearheaded by LISTnet. This program will also help create opportunities for those who are co-working in or leasing space from LaunchPad Mineola. LaunchPad opened its doors in February of this year. Just a short walk away from the Mineola train station and a 30 minute ride from New York City, the business incubator allows for startup companies to rent and share office space for low prices and work in a social environment to promote creativity. The facility spans across three floors and all 12,000 square feet of a Mineola building that most recently housed a law firm and deli, the latter became the LaunchPad Café. The duo has invested $100,000 in the space which includes: chalkboard walls and glass desks, conference and meeting rooms,a lounge with plasma-screen TV, and ping pong, foosball and pool tables. They have committed $250,000 for a seed fund that will help grow LaunchPad local startups. Their community companies include a local, high tech catering/vending business, a local news aggregator and original news source destination, a startup which provides college students with the knowledge to start and run their own businesses, and many more. About 10 start-up groups have been accepted to start using the space, but there are about 50 more applications lined up. About 20 companies moved from Brooklyn spaces, into the Mineola space. 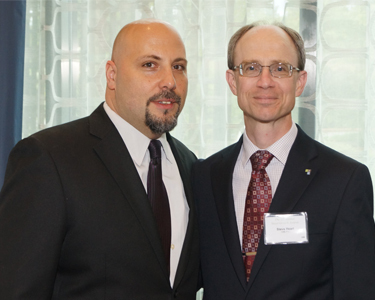 President and CEO of LISTnet, Peter Goldsmith, accepted the award for his company, and both Andrew Hazen and Richard Foster accepted for LaunchPad, who emphasized the key factor of their success: transportation. 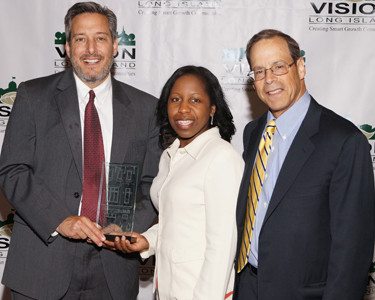 The award for “Transportation Choices” went to Seven Bus, previously known as BoltBus, for providing alternative transportation for Suffolk to Manhattan commuters. In December, BoltBus added Long Island to its bus service network. Long Island Bolt has been making 14 daily round trips to New York City from Ronkonkoma, Riverhead, and Melville each weekday and about eight or nine roundtrips on weekends, making stops on the Third Avenue at 40th and 59th Streets. The weekday morning and evening commuter are the fastest selling tickets, costing anywhere between $7 to $15. On Friday June 7th, Classic Coach, operator of the local BoltBus routes, announced that it will break away from Bolt Bus and rebrand itself as 7Bus. The new service will offer monthly commuter rates, add additional stops, and continue to offer all of the same amenities previously offered by Bolt Bus. The new 7Bus line will provide on-board amenities such as comfortable leather seats, extra legroom, free Wi-Fi and power outlets. Passengers have online access to 7Bus where they can book their tickets. 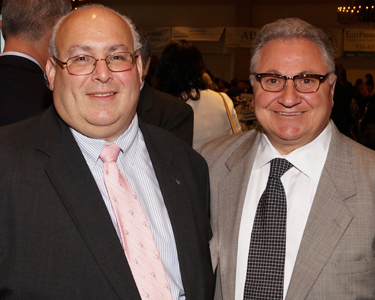 The award was accepted by Bill Schoolman and Michael Schoolman of 7Bus, who emphasized buses as a great asset and mode of transportation to connect Long Island. The award for “Revitalizing Communities” went to the “Yes We Can” Community Center, located in New Hempstead on 141 Garden Street, for providing a great, much-needed space for the community of New Cassel. The center is a state-of-the art, 60,000 square-foot facility which features two NBA-size basketball courts, a fitness center, game room, dance and television studios, an internet café, and a multi-purpose rental space. The community center is a platinum LEED (Leadership in Energy and Environmental Design) certified structure featuring rooftop solar panels, grade-level solar trees, electric vehicle recharging stations and geothermal heating and cooling. The success of this project took commitment, hard work, and a lot of patience from the members of the community and its leaders. 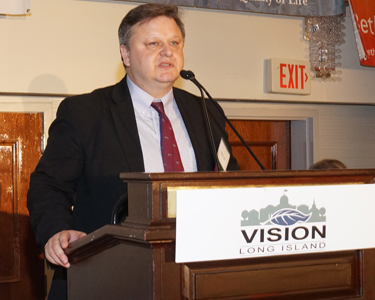 The award for “Housing Choices” went to Linden Knolls Residence, which has played an important role in the revitalization of the Village of Hempstead and will provide much need housing to the community. This project is a five story building which will comprise of a total of 100 apartments consisting of 10 one bedroom units, 85 two bedroom units and 5 three bedroom units. It is an affordable Family Housing Project with 4% Tax Credits (NYS HCR), plus $18.25M Tax Exempt Bonds, with State of New York Mortgage Agency Mortgage Insurance Fund Credit Enhancement, plus conventional financing $8.4. The full basement will be designed as a social center, child development center, wellness center, community laundry area, a workout room, management office and space for office rental. The design includes a CCTV System covering all exterior entrances, halls, elevators and common areas. In addition, the site will house an exterior playground, outdoor patios and on site parking. Each living room will receive a bay window to create a open and bright atmosphere to each unit. 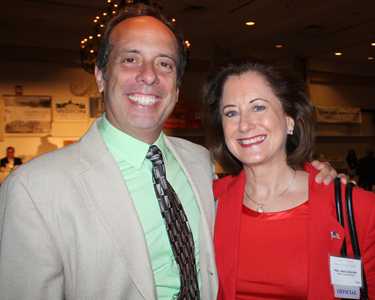 For their efforts and successes in the revitalization of Main Street in Smithtown, the award for “Walkability” went to Lavena Sipes of the Courtney Sipes Memorial Foundation and Mark Mancini of the Greater Smithtown Chamber of Commerce. Lavena Sipes, the mother of Courtney Sipes, founded Smithtown Residents for a Safer Main Street and The Courtney Sipes Memorial Foundation was not easily knocked down by the tragic loss her daughter. Lavena was inspired to protect the safety of pedestrians and all users of the road. 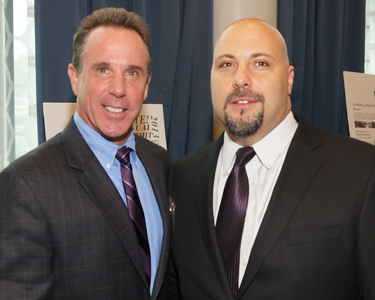 Mark Mancini of the Smithtown Chamber of Commerce, motivated by the hopes that his children could cross safely on Main Street, created the drawing concepts for Smithtown on his own time. He developed a drawing that included the wishes and wants of the Smithtown residents. The design included brick sidewalks, center islands, turning lanes, a new public sewer line, and underground utilities. For the past five years, Mark has talked and planned with everyone in the community in hopes of making a better, safer Main Street. Together, along with the support from the residents and local officials and organizations, have made great revitalization strides and the project is now moving along. Some of the changes to Main Street include reducing eastbound traffic to one lane and installing left turn lanes in several intersections, multiple painted lanes to make left turns, markings to extend and re-paint the crosswalk at Lawrence Avenue, and markings to paint a median, which has improved traffic and created an area of refuge. 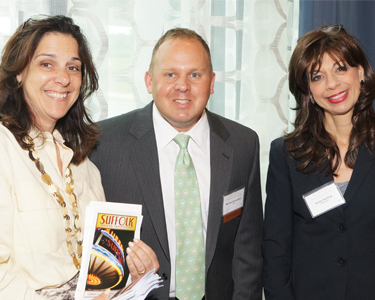 Both Lavena Sipes and Mark Mancini accepted the award. 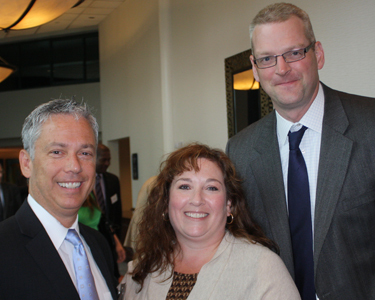 Mark emphasized the importance of pedestrian safety and its affect on the local economy. Lavena Sipes reminded the audience that “it is our collective drive and determination” which will keep stop further accidents and pedestrian fatalities. 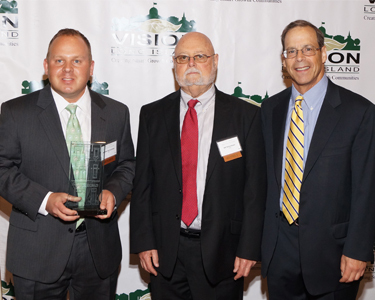 The award for “Clean Energy” went to the Long Island Power Authority’s Clean Energy Programs which help maximize electricity savings, environmental benefits, and provide economic benefits to homes, businesses, and schools all across Long Island. LIPA’s Clean Energy Programs offer a multitude of Residential, Non-Residential, and All Sector program options for customers. These programs are all aimed at both lowering energy consumption as well as emissions, providing cleaner, more stable energy for customers. 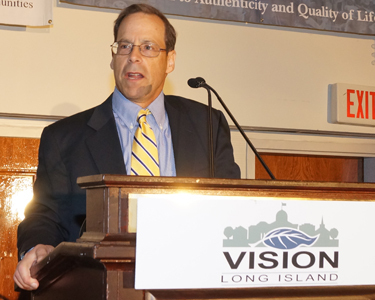 The program options were designed to maximize electricity savings, environmental benefits, net economic benefits to Long Island, minimize electric rate impacts, and cost effectively address peak load capacity needs. LIPA has made a commitment to bring clean, sustainable energy options to its customers and help reduce dependence on fossil fuels in order to meet all future energy needs. 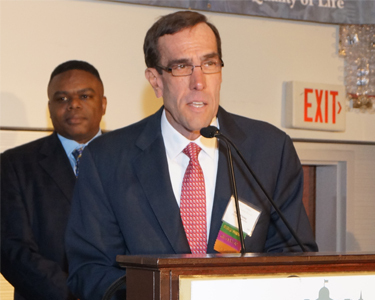 LIPA Chief Operating Officer, John McMahon accepted the award, along with LIPA Board Member Neal Lewis, was honored to receive this award in recognition of the hard work and commitment to a clean energy future. 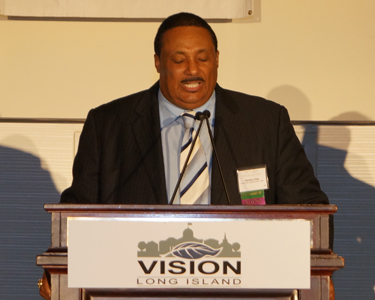 The award for “Revitalizing Communities” went to the Honorable Steve Flotteron and the Central Islip Coalition of Good Neighbors. A decade long journey of various roadblocks and town hall meetings resulted in a brand new park for the community of Central Islip. After several surveys, lists, and tracing paper designs the result was a park which would feature a great lawn, walking/biking trails, exercise stations, historic displays, picnic areas, a skate park, volleyball courts, soccer fields, a fountain/spray park, a bandshell, games like bocce ball, shuffleboard tables and chess tables, benches, concessions, restrooms, a playground, a koi pond, and even more. There will be an exterior gate with road improvements to the surrounding streets. The project will be implemented in three phases. It was a project that took a lot of hard work and dedication from elected officials, groups and organizations, and of course, the local residents. Councilman Steve Flotteron of the Town of Islip, Amparo Sadler, Debbie Cavanagh, and Debbie Rotunda from the Central Islip Coalition of Good Neighbors accepted the award. The award for “Environmental and Historic Preservation” went to Joy Squires, for her work in creating and maintaining great open spaces in her community. For years, Joy has been an advocate for the preservation of parks and recreational open spaces, representing Huntington’s environmental issues on the Suffolk County Council on Environmental Quality. She serves as Chairperson of the Huntington Conservation Board and the Town of Huntington's Environmental Open Space Committee. Joy is also president of the NYS Association of Conservation Commissions whose mission is to promote the wise use of the State’s natural resources through education and action. 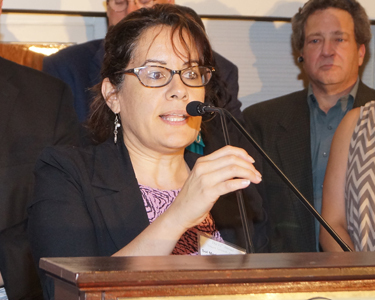 As president of NYSACC, she is involved in speaking with a united voice in matters of environmental planning and protection, by encouraging and supporting sound environmental policies and actions locally and throughout New York State. Joy has helped preserve and attain acres and acres of great natural spaces that have provided communities with a clean, open environments. Her work on the various boards and committees has helped her Town and the various residents, groups, villages, and natural resources that reside within in it. She has helped lead the Town of Huntington's in parkland purchase, improvements, and management which resulted in neighborhood enhancement programs that invite citizens to take part in the preservation of their local parks and trails. Joy Squires accepted her award, thanking and bringing on stage her colleague and friend Margo Myles and acknowledged the people in her community who have helped make these projects possible. 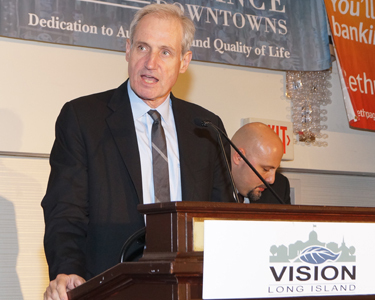 The award for “Certainty” went to Connect Long Island, an initiative which aims to attract, develop, and retain workforce talent for Suffolk County and the region, while also improving the local economy, and Republic Station in Farmingdale. Connect Long Island calls for new transportation infrastructure that connects Suffolk’s valuable assets such as great educational and research facilities and major infrastructure improvements already in process, including the Long Island Railroad’s Double Track project, with vibrant downtown developments and innovation zones. These changes are designed to attract, retain and grow clusters of businesses around existing and enhanced transportation corridors, research institutions and municipal land. The Route 110 Bus Rapid Transit System would be Long Island’s first north-south mass transit connection and would greatly improve access to the area, creating new opportunities while also easing traffic congestion. Republic Station, originally opened in 1940, was a stop along the Ronkonkoma Branch located near Republic Airport in Farmingdale and utilized by the employees of a local aircraft and aerospace manufacturing company. Once the factory was gone in 1986, the Long Island Rail Road station was closed down due to an exponential decline in ridership. While it had served the company for many years, with the factory shut down the station was deemed unnecessary. Now, as part of the Double Track Project, a project to install a second track between Farmingdale and Ronkonkoma, the blighted Republic Station will be rebuilt to anchor a mixed-use transit hub. The plan applies smart, sustainable land use practices and transit-oriented development in East Farmingdale and will implement a new north-south transit bus system along the Route 110 corridor. Suffolk County Executive Steve Bellone and Supervisor Rich Schaffer of the Town of Babylon accepted the awards, respectively. 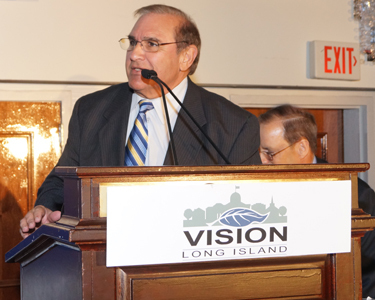 They were excited to see some movement on the projects and were hopeful of their success, emphasizing the importance of reliable, sustainable transportation in order to secure Long Island’s bright future. Pictured (Left to Right): US Congressman Peter King, Northport Village Trustee Tom Kehoe accepting on Congressman King's behalf, who could not attend due to a scheduled vote in Washington D.C. This year’s award for “Regional Leadership” went to Congressman Peter King for successfully delivering federal relief for Hurricane Sandy to the Northeast region and for his efforts in the passage of the Federal Transportation bill last year. Despite opposition from his party, Congressman King came forward to remind us that in times of disaster New York has been one of the first to step up and provide assistance to those in need. For Representative King, showing regional leadership and support in a time of need was more important than worrying about politics or ideologies. Additionally, Representative King worked tirelessly to get the federal transportation bill, HR 4348, passed in the House of Representatives last year. 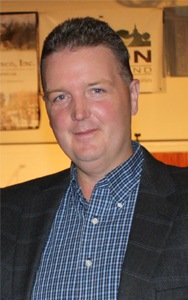 Northport Trustee Tom Kehoe accepted the award on his behalf, acknowledging King’s battle for money while other legislators refused after Sandy and his work as a proponent of East Side Project. For their hard work, efforts, and support in the wake of disaster, the award for “Regional Leadership” went to the organizations, businesses, and hundreds of volunteers of Superstorm Sandy. Community groups, both new and existing, and volunteers from all over the island stepped up to help the victims of Sandy and affected communities. 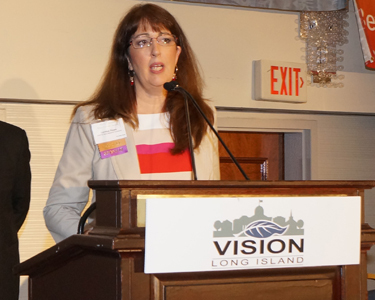 After Vision Long Island’s summit, requests were made from communities for assistance. 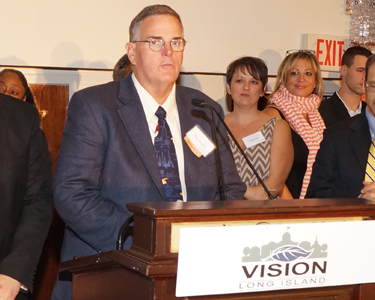 Vision Long Island was able to gather over 100 volunteers the weekend following the summit. Months later, Vision has had over 500 hundred volunteers who have donated their time to come out on weekends to help the devastated homes and communities. Simultaneously, many community groups were building their own base with the philosophy of “Pay It Forward.” Over 150 homes were ripped out and 30 homes were rebuilt. Many municipalities provided mutual aid-type services to the impacted communities, sending sanitation workers, trucks, and other resources to help these communities become once again habitable. Many businesses showed their support by providing charging stations, meals and cleaning supplies for the volunteers and victims of the storm. Some went so far as to provide housing for displaced families or even financial support in the form of grants. Rich Cantwell of Friends of Freeport, Amy Castiglia of Lindy Manpower, John McNally of Friends of Long Beach and Jon Seibert of the Mastic-Shirley Jubilee Recovery Center/COAD accepted the award and were joined onstage by a large crowd of volunteers from various organizations. 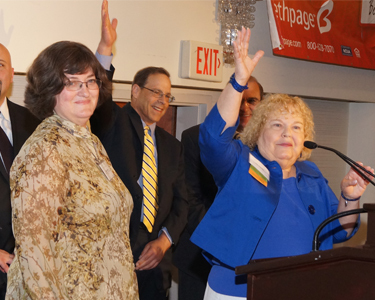 Sol-Marie Alfonso Jones of the Long Island Community Foundation, also an honoree, was presented with a hammer and a crowbar, signed by all the volunteers, as a thanks for providing the volunteer groups with much needed recovery grants. The volunteers received a standing ovation from the audience. 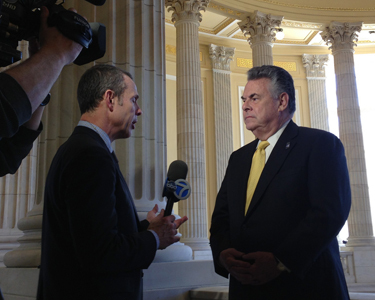 US Congressman Peter King said, “I’ve been in Congress for several major storms, the main one being Katrina. We appropriated 11 billion dollars in 10 days and another 54 billion dollars within 6 or 7 days so I assumed it would be roughly the same with this but then we started seeing the resistance. We were almost made to feel like beggars as if we were asking for something unprecedented. It was jarring to see that. I went to the house floor and demanded that action be taken. Rich Cantwell from Friends of Freeport said, “Immediately after the storm we saw the absolute devastation. The floodwaters receding people walking around deer in the headlights. We weren’t impacted like others so we just wanted to do what we could even if it was just a matter of asking ‘what do you need." 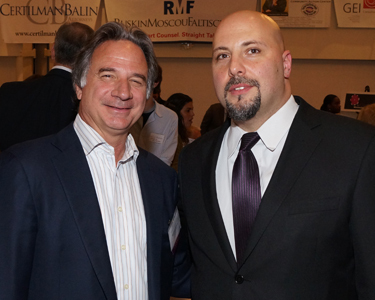 North Hempstead Town Supervisor Jon Kaiman said, "The Revitalizing Communities Award is a very fitting honor as our North Hempstead 'Yes We Can' Community Center has been the defining icon of New Cassel's ongoing multi-million dollar revitalization. What was once a dream for the residents of New Cassel, is now a reality that is helping unite a community that longed for a facility such as this one for decades." 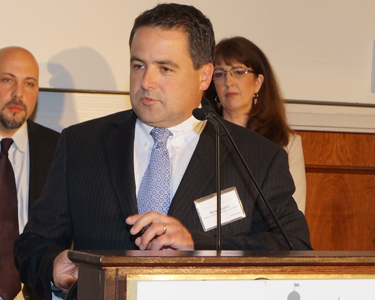 Huntington Town Supervisor Frank Petrone said, “Joy is well-deserving of this award. For more than 35 years, she has been instrumental in helping the Town maintain its status as a leader in preserving open space. She has been a driving force in helping to create and implement key Town environmental stewardship activities, such as open space protection, park stewardship, trails initiatives, and the Town’s STOP Program and recycling of household hazardous waste. As the long-term chair of the Conservation Board and only chair of the Environmental Open Space Committee, Joy’s volunteer activities have provided environmental input and guidance for the betterment of Huntington residents." 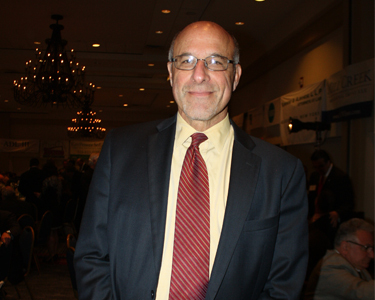 Micheal Schoolman from 7Bus said, The Long Island Expressway is the second most congested roadway in the United States. Mass transportation of buses occurs in all the areas around New York City apart from Long Island. A bus is a wonderful asset, it’s a way of connecting the island." 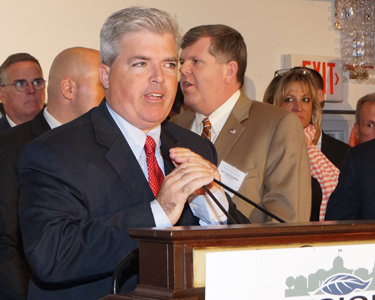 Suffolk County Executive Steve Bellone said, “Where do we want to be in twenty years? Do we still want to be fighting traffic every single day; struggling to make ends meet; and losing the fight to keep young adults on Long Island? 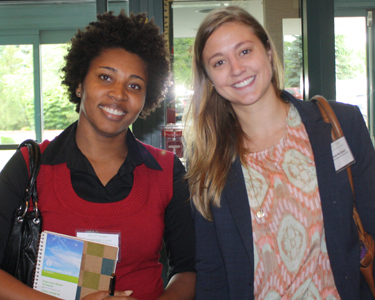 Or do we want to solve the transportation, housing and economic challenges that confront us today? To do so, we have to start with innovative planning and effective implementation. 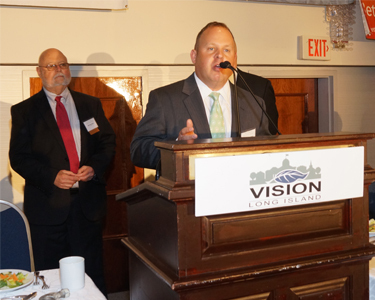 I thank Vision Long Island for finding “Connect Long Island” worthy of recognition as the Smart Growth Planning Award recipient. 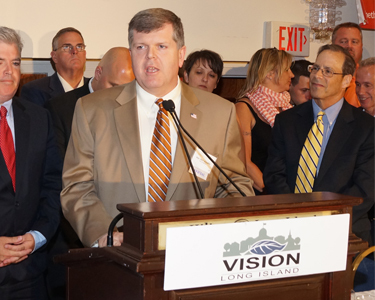 The “Connect Long Island” initiative aims to create new mass-transit connections between major roadways, Long Island Rail Road stations and transit-oriented downtowns to relieve traffic congestion, increase mobility, and spur economic growth. Nassau County Executive Ed Mangano said, “My administration is working tirelessly to put people back to work by attracting new businesses and ensuring current employers stay and grow in Nassau County. In partnership with the IDA, I have created and retained over 19,000 private sector jobs. Together, we have revitalized hundreds of acres of former defense industry property into state-of-the art movie and television studios. With four great proposals for the Coliseum site, we will reinvigorate the Hub and create new jobs for our residents." The event journal is available online here. Special thanks to our videographers, Them Media. Watch all of the honoree videos on our YouTube page. 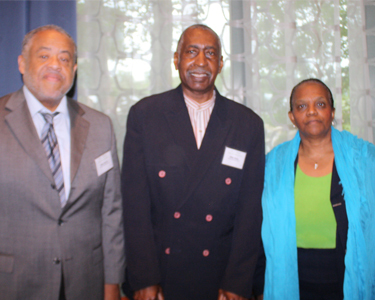 View the article on Smart Growth Award winner Joy Squires from the Huntington Conservation Board. 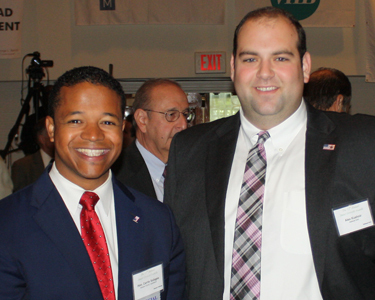 Pictured (Left to Right): Eric Alexander - Vision Long Island, Steve Hearl - H2M, Greater Hempstead Redevolopment Corp.
Save the Date for the 12th Annual Smart Growth Summit on Friday, November 22nd!